Crafted from a vintage grey barn that had been painted white, this 100% upcycled picture frame moulding, in a very limited supply, features a two-toned finish of light and dark gray, along with the possibility of white paint chips sprinkled across the surface in delightfully unexpected and inconsistent ways. Made right here in the U.S.A., you’ll find each of these eco-friendly picture frames, has variety in wood grain, knots, nail holes, weathering, and so much more to bring it’s personality to life. With a simple square profile, its shape offers a world of possibilities for fine art posters, black & white photography, maps, portraits and so much more. Looks like it was pulled right out of a barn! Have painting of barn that needed frame, this was best compliment. 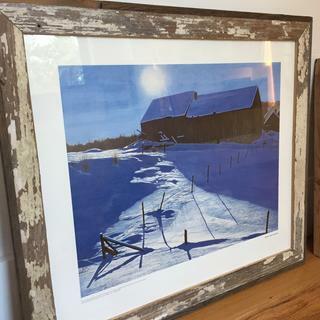 The rustic texture, varied muted tones, and simplistic structure go perfectly with my Andrew Wyeth print. My home is sort of a "minimalist open barn style" ... this frame is a perfect complement to that style. 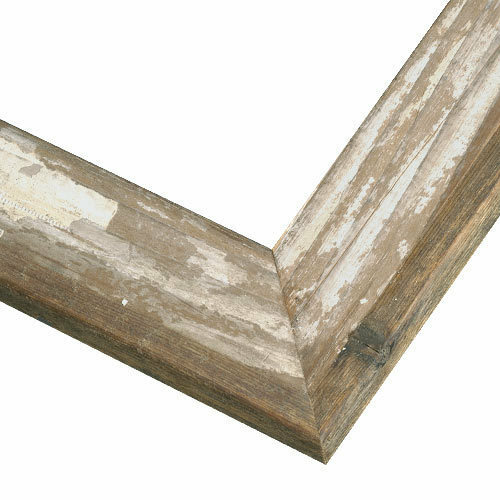 I really love the look of this frame...definitely American Farmhouse style. does this frame include glass on the front and a backing with built in clips for hanging? Unless otherwise noted on our site or catalog, our frames don’t automatically include acrylic glazing and foam core backing kits. We don’t sell glass for frames, we sell picture-frame quality acrylic which is plexiglass. Glazing and backing kits are not included automatically because not all artwork or customers need them for framing. Canvas paintings, for example, would be damaged by glazing of any kind. These are offered as separate add-on items during the ordering process which can be added after a frame size is selected. If you require glazing and backing kits to complete frames, you can order acrylic and foam core backing on the product page under section "3.Complete My Frame With an Acrylic Front & Foamcore Backing" or by calling 1-800-332-8884 and placing a phone order with any of our Advisors, any time from 8 am – 7 pm EST Monday thru Friday. BEST ANSWER: Hello Patricia! Thank you for your inquiry. This unique frame can be cut to size 9"x7". Please let us know if you need assistance placing the order. Happy Framing!